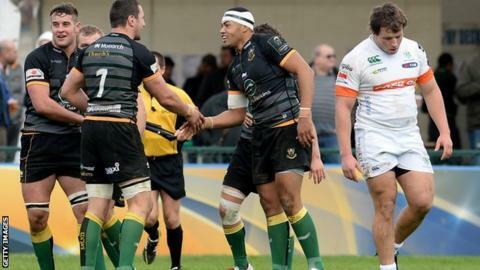 Northampton scored six tries as they easily won their European Champions Cup Pool Five game in Treviso. Samu Manoa and Alex Waller touched down to give Saints a 12-3 half-time lead. Ben Foden and Luther Burrell added a try apiece in the space of two minutes to extend their advantage to 26-3. A penalty try for Saints and George Pisi's last-minute score cancelled out second-half Ludovico Nitoglia and Joe Carlisle tries as the visitors moved top of their pool. Northampton remained above Racing Metro at the top of the pool after the French side were denied victory by a late Ospreys try in a 19-19 draw. The triumph in Italy was the sixth win in seven games in all competitions for Jim Mallinder's Premiership leaders. Saints number eight Manoa opened the scoring after nine minutes when he finished off a patient build-up by forcing his way over from close range for his fifth try of the season. A change of referee because of an injury to Peter Fitzgibbon delayed the game for several minutes and the replacement official Leo Colgan was soon involved by awarding Treviso a penalty. But Colgan then sent lock Francesco Minto to the sin-bin after he tackled Sam Dickinson in an offside position and Saints immediately grabbed a second try. Stephen Myler kicked the penalty to touch and the Saints' eight were too strong for the under-strength Treviso pack, with prop Waller scoring. The visitors secured the bonus point within nine minutes of the restart with two quick scores from Foden and Burrell. The England centre set up Foden's try with a superb pass to set the full-back free and he produced a smart finish, with Myler kicking the difficult conversion. Almost immediately, Saints went over for their fourth try after excellent work by Tom Stephenson and Jamie Elliot allowed Burrell to finish. Treviso got back into the contest when fly-half Carlisle sent a long pass to wing Ludovico Nitoglia to go over in the corner. But Saints reasserted their authority with a penalty try after Treviso popped up at the scrum and the home side were reduced to 14 men for the second time when replacement Romulo Acosta was shown a yellow card. Treviso did however manage a second try when the impressive Carlisle intercepted Stephenson's pass and raced home from 60 metres out. But there was still time for Saints to get their sixth try when replacement Pisi touched down with two minutes to go. Northampton Saints forwards coach Dorian West said: "When you come to these places your forwards have got to be ruthless, you have to work hard and take the energy out of their defence. "We knew it was going to be tough, especially early on. They are a good side with some really good players. "Racing Metro had come here and left without a bonus point so we knew we would have to be at our best if we were going to get maximum points. "We worked really hard in the first half, especially the forwards, to take the legs out of their pack and that created some space later on. That's exactly what we thought would happen and we have got to be pleased with our game plan." Treviso: Hayward; Ragusi, Campagnaro, Christie, Nitoglia, Carlisle, Lucchese; Muccignat, Giazzon, Manu; Pavanello (capt), Minto, Favaro, Zanni, Budd. Replacements: Kudin for Giazzon (67), Zanusso for Muccignat (43), Acosta for Manu (38), Vallejos for Barbini (64), Barbini for Zanni (14), Morisi for Campagnaro (41), Gori for Lucchese (54). Northampton: Foden, K Pisi, Stephenson, Burrell, Elliott; Myler, Dickson; A Waller, Haywood, Ma'afu; Dickinson, Day, Clark, Dowson (capt), Manoa. Replacements: Hartley for Haywood (61), E Waller for Dickson (64), Lawes for Clark (66), Fotuali'i for Day (64), G Pisi for Burrell (56).